It was founded in Ankara in 1974 by Prof. Dr. Güntekin Köksal under the name, Pet Trade Office. Taking its name from the first three letters of the word petroleum, over the years, Pet Holding has successfully completed projects in various areas as petroleum exploration and production, mining, construction, tourism in various parts of the world. Our company has formed a number of local and international partnerships on five different continents and has been working actively in Turkey, Middle East, Middle Asia, Europe and Africa. 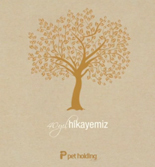 Pet Holding has been one of the respected companies of Turkey and the world with its international vision, business ethics, honesty, win-win approach and its respect for people. Pet Holding is a pioneer enterprise that takes risks.